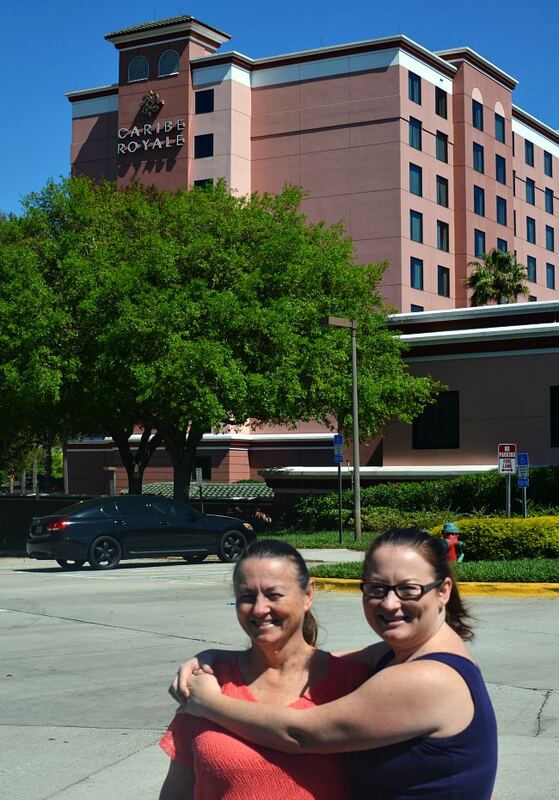 My mom and I just got back from a fabulous ‘Girlfriend Getaway’ weekend at Caribe Royale in Orlando, Florida. Believe it or not, this was our first mother/daughter trip together, and we had such a great time that I’m thinking about making it an annual event — hopefully next time my sister can join in. We started our weekend on Friday afternoon when we checked into our Double Queen Suite. The room was super spacious, having both a living area and bedroom with a bathroom in between. 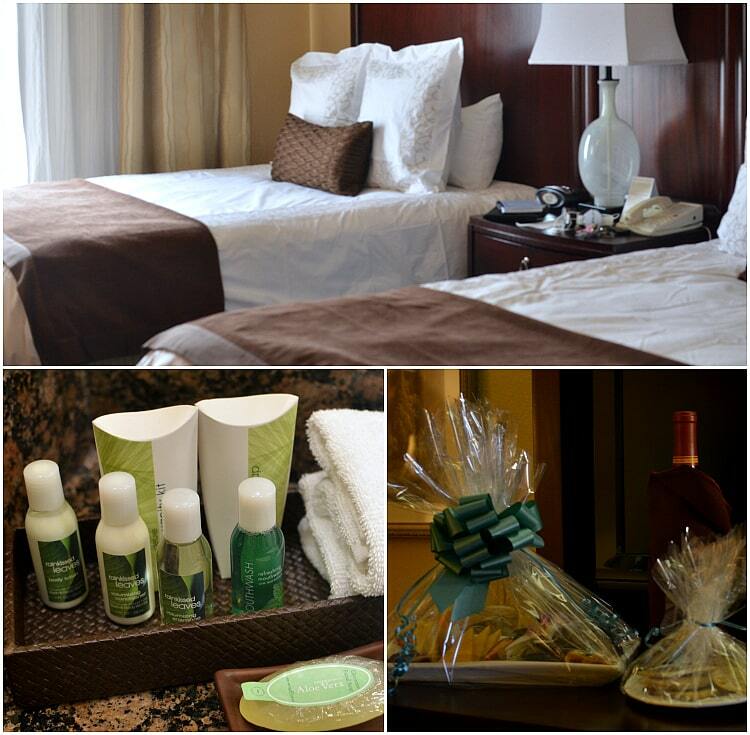 The Queen beds were SUPER comfy and the bath amenities were from Bath & Body Works … who wouldn’t love that!? My mom and I were treated to a welcome amenity of wine and cheese, which we devoured in no time — not a bad way to start the weekend! We left the hotel for dinner off-site and one of the things I noticed was how great the location is. 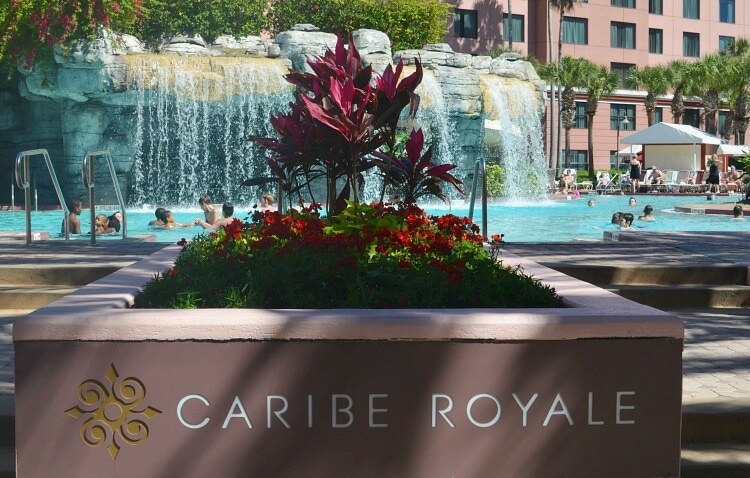 Caribe Royale is right in the middle of all the action, whether you’re visiting Walt Disney World, Universal Orlando or SeaWorld. 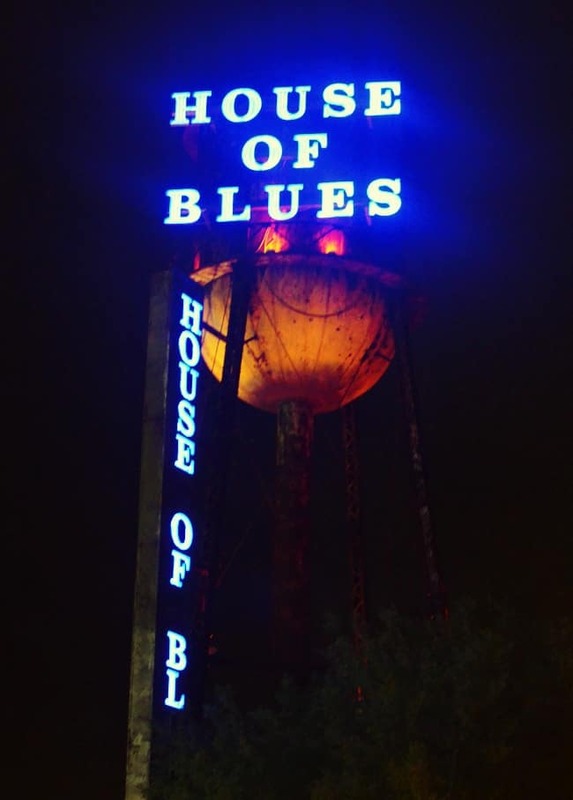 Plus, there are a million other attractions in the area and it’s an easy drive to I-4, International Drive or 192. Saturday morning we, unfortunately, woke up to rain showers. And unlike most gloomy weather in Florida, this storm didn’t pass within an hour or two. Our day at the pool and cabanas were out, but we had spa appointments planned that more than made up for it. 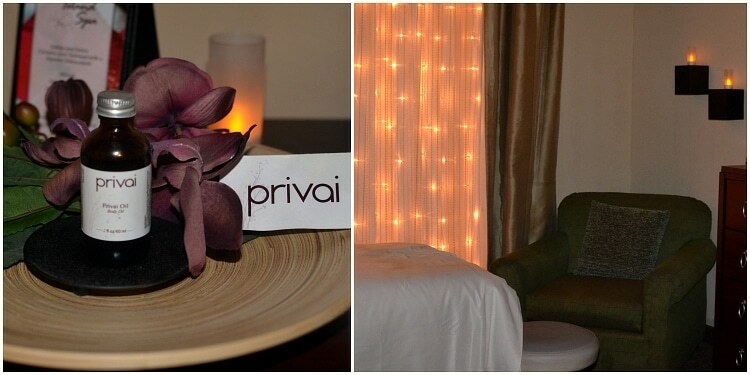 Our first appointment at The Island Spa, located on-site, was for the signature Bliss Massage. I’ve had my fair share of massages, but this was my mom’s first ever professional treatment. I was giddy for her because I knew she was going to love it …. And I was right! We each had our massage, and if hers was anything like mine, it was heavenly. The masseuse did a great job, and I was in pure bliss for the 60-minute treatment. My mom commented after on how much she enjoyed the experience with the tropical aromatherapy and foot mask (a nice bonus!). Immediately after we enjoyed side-by-side Classic Pedicures. The nail technicians did an amazing job on our toes. I go pretty regularly for pedicures, but these women went above and beyond making sure each nail was painted perfectly. A week later my pedi still looked great! I really can’t say enough about the Island Bliss Spa at Caribe Royale. It’s a small operation, but each of the services was top notch. After our appointments we decided to brave the storm and get some retail therapy in at the Mall at Millenia and Ikea. Once again, it was so easy to get where we wanted to go from Caribe Royale. Sunday morning we woke up to wonderful sight — SUNSHINE! It was a gorgeous day and guests flocked to the pool area, which really is a tropical playground. We both had to be home that afternoon and didn’t have a lot of time to use the facilities, but I did get a few minutes of sun. The waterslide looked so cool, and I know my daughter would have gone crazy for the waterfall area and kids’ splash zone. My mom and I enjoyed a little snack at Café Largo with a credit we received before our drive home. The market-style eatery is open 24-hours for guests and has a ton of options, including hot food, made-to-order pizza, packaged meals, a salad bar and a variety of snacks, wine, beer and other beverages. 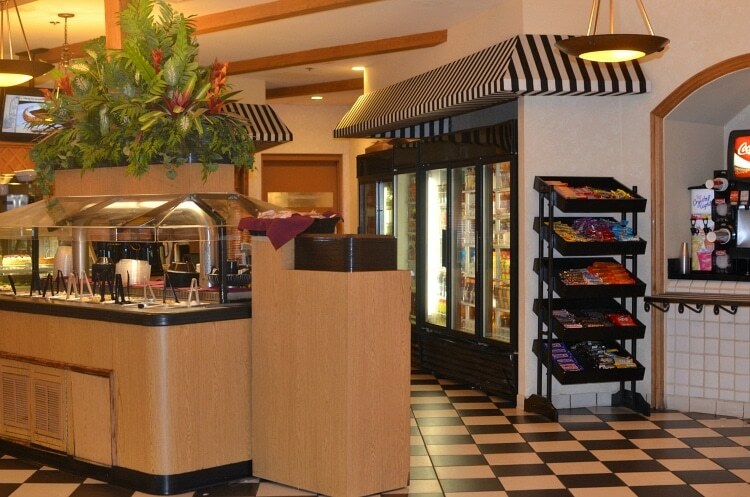 It’s a one-stop shop if you need a quick bite or are looking for some treats to take back to your room, where there’s a mini-fridge. I’m going to be honest, I was sad when we checked out of Caribe Royale because our stay was so enjoyable. The staff was incredibly friendly and accommodating. My mom and I got along all weekend (a first! 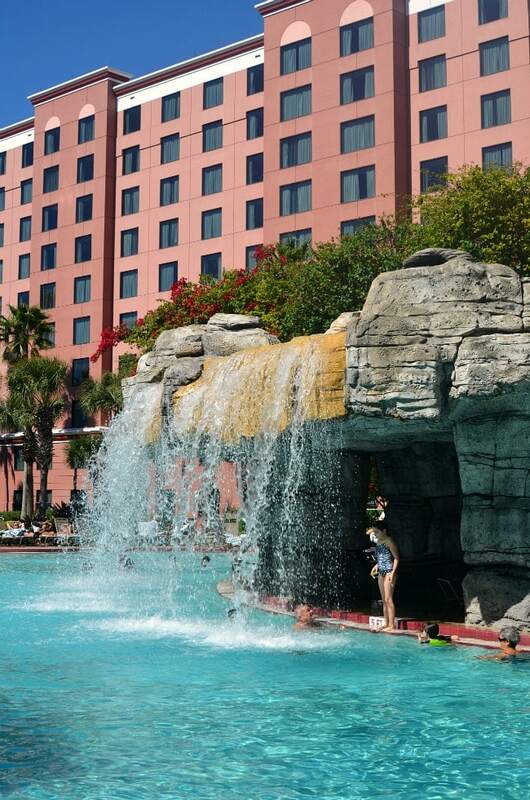 ), and I can’t wait to return so we can test out those poolside cabanas with tropical drinks and dine at Caribe Royale’s AAA Four-Diamond restaurant, The Venetian Room. 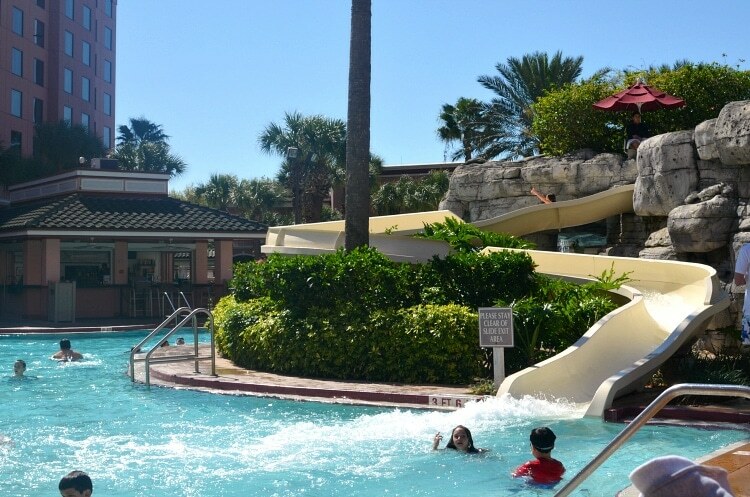 If you’re looking for a great place to stay in Orlando for a family vacation, romantic escape or girlfriend getaway, definitely consider Caribe Royale All-Suite Hotel. Make sure to check out all of their current packages and specials at www.cariberoyale.com/specials-packages. 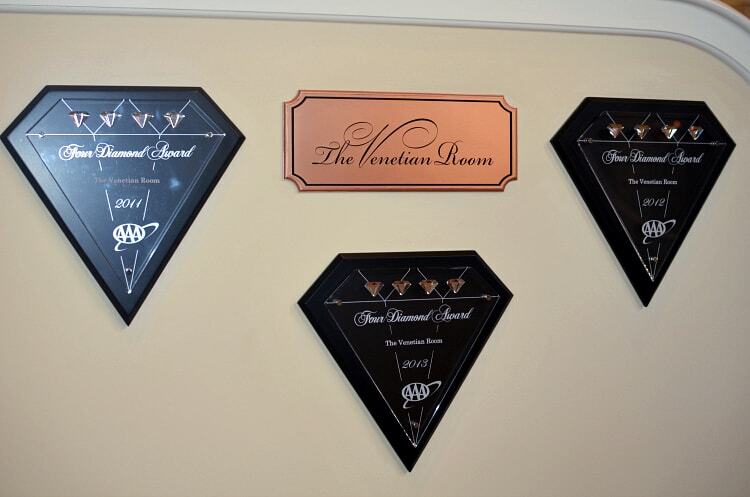 Special Offer: 15% off non-discounted Best Available rate plus a one-time $25 spa credit for travel April 24 – August 15, 2014 – minimum two night stay required. Click here to book by April 30, 2014. 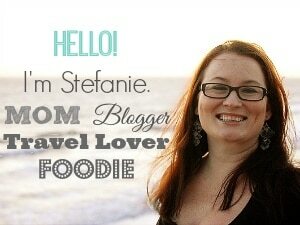 Also, be sure to join Stash Hotel Rewards (for free!) to earn points for qualifying stays. Those points quickly add up and can be redeemed for free nights at amazing hotels across the United States. As an additional bonus, Stash members who enter their Stash ID on their reservation will also receive some great perks, including free in-suite, high-speed internet for their entire stay, a check-in Stash bag with two bottles of water and a $25 discount spa coupon, free suite upgrade, and early check-in and late check-out (the latter two are all based upon availability). Membership is free and registration is simple, just visit this site.